Some musicians can be quite proficient and have to find additional outlets for the songs they write that don’t necessarily fit the context of their current band. Sometimes it works (I love me some Traveling Wilburys, Temple Of The Dog and The Raconteurs), sometimes it doesn’t (here’s looking at you Power Station, Velvet Revolver and Chickenfoot) and sometimes it creates something just crazy enough to be awesome (Tom Tom Club anyone?). Mike Herrera has enjoyed years of success as the lead singer, bass player and songwriter in the punk band MxPx, but feeling the urge to trade in his bass for an acoustic guitar, he formed Tumbledown in 2007. 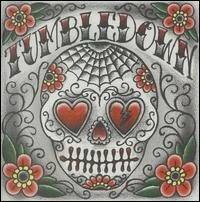 Tumbledown mixes the energy and fun of punk with the musicianship and heartbreak of country. Imagine putting an old Hank William’s record on to play but choosing the wrong speed. They are really, really fun to listen to and are really good musicians. The drums are as steady as a locomotive, the bass gets you moving, the electric guitar sounds like a bluegrass wild fire, and Mike added just enough twang to his distinctive vocals to sound authentic. So far they’ve released one EP, Atlantic City, and one self-titled full length. “Homeward Bound” is probably my favorite song off Tumbledown. The imagery in the lyrics and the catchy melody make it impossible to not sing along with. Even if you can’t sing harmony, this song will make you think you can. I love the third verse’s shout out to Mike’s hometown and to the county fair. I have such great memories of going to our county fair when I was in high school. It always took place in the fall (my favorite time of year) and the snuggly weather and squished together physics of the rides make it perfect for a date. Plus, there is no denying that classic rock anthems sound better and hot dogs are tastier at the fair. The guitar solo and bass breakdown on this song are absolutely amazing as well. Last month I saw some pics that showed Tumbledown being pressed on root beer colored vinyl. It looked really great and hopefully it will be released sometime soon.